An RCA connector, sometimes called a phono connector or (in other languages) Cinch connector, is a type of electrical connector commonly used to carry audio and video signals. The name RCA derives from the Radio Corporation of America, which introduced the design by the early 1940s for internal connection of the pickup to the chassis in home radio-phonograph consoles. It was originally a low-cost, simple design, intended only for mating and disconnection when servicing the console. Refinement came with later designs, although they remained compatible. The connection's plug is called an RCA plug or phono plug, for "phonograph." The name "phono plug" is sometimes confused with a "phone plug" which may refer to a quarter-inch "phone plug" – Tip/Sleeve (TS) or Tip/Ring/Sleeve (TRS) connector – or to a 4P4C connector used for a telephone (which is often, though incorrectly, called "RJ9", "RJ10", or "RJ22"). The back of an RCA AM radio from the 1940s with RCA connector for adding a turntable. Tag around connector reads "An inexpensive RCA Victor record player will make a fine Victrola of this radio. Plug here." The word phono in phono connector is an abbreviation of the word phonograph, because this connector was originally created to allow the connection of a phonograph turntable to a radio receiver, using the radio as an amplifier. This setup was present in most radios manufactured in the 1930s onward by the Radio Corporation of America (RCA), who later marketed a special turntable for 45 RPM records, the model 9JY. A phono input is a set of input jacks, usually RCA jacks, located on the rear panel of a preamp, mixer or amplifier, especially on early radio sets, to which a phonograph or turntable is attached. Modern styli (phonograph needles) and phono cartridges give a very low level output signal of the order of a few millivolts which the circuitry amplifies and equalizes. Phonograph recordings are made with high frequencies boosted and the low frequencies attenuated: during playback the frequency response changes are reversed. This reduces background noise, including clicks or pops, and also conserves the amount of physical space needed for each groove, by reducing the size of the larger low-frequency undulations. This is accomplished in the amplifier with a phono input that incorporates standardized RIAA equalization circuitry. Through at least the 1980s, the phono input was widely available on consumer stereo equipment—even some larger boomboxes had them. By the 2000s only very sophisticated and expensive stereo receivers retained the phono input, since most users were expected to use digital music formats such as CD or satellite radio. Some newer low-cost turntables include built-in amplifiers to produce line-level (one volt) outputs; devices are available that perform this conversion for use with computers; or older amplifiers or radio receivers can be used. Nearly all DJ mixers have two or more phono inputs, together with two or more one-volt line inputs that also use RCA connectors. This "phono input" designed for the millivolt signal from an unamplified turntable should not be confused with the modern standard one-volt line input and output that also uses RCA connectors and is found on video cameras, recorders and similar modern equipment. RCA sockets, or jacks, here used for YPbPr video output. Composite video cable for the Xbox 360. In the most normal use, cables have a standard plug on each end, consisting of a central male connector, surrounded by a ring. The ring is often segmented to provide spring gripping pressure when mated. Devices mount the socket (female jack), consisting of a central hole with a ring of metal around it. The ring is slightly larger in diameter and longer than the ring on the plug, allowing the plug's ring to fit tightly over it. The jack has a small area between the outer and inner rings which is filled with an insulator, typically plastic (very early versions, or those made for use as RF connectors, used ceramic). The connector was initially used for audio signals. As with many other connectors, the RCA has been adopted for other uses than originally intended, including as a DC power connector, an RF connector, and as a connector for loudspeaker cables. Its use as a connector for composite video signals is extremely common, but provides poor impedance matching. RCA connectors and cable are also commonly used to carry S/PDIF-formatted digital audio, with plugs colored orange to differentiate them from other typical connections. Connections are made by pushing the cable's plug into the female jack on the device. The signal-carrying pin protrudes from the plug, and often comes into contact with the socket before the grounded rings meet, resulting in loud hum or buzz if the audio components do not share a common ground and are powered while making connections. Continuous noise can occur if the plug partially falls out of the jack, breaking the ground connection but not the signal. Some variants of the plug, especially cheaper versions, also give very poor grip and contact between the ground sheaths due to their lack of spring action. 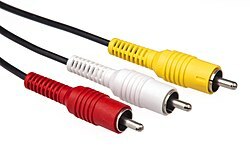 They are often color-coded, yellow for composite video, red for the right audio channel, and white or black for the left channel of stereo audio. This trio (or pair) of jacks can be found on the back of almost all audio and video equipment. One or more sets are often found on TV sets to facilitate connection of camcorders, other portable video sources and video game consoles. Although nearly all connectors, including analog and S/PDIF audio as well as composite and component video, can use identical 75 Ω cables, sales of special-purpose cables for each use have proliferated. Varying cable quality means that a cheap line-level audio cable might not successfully transfer component video. For digital audio, as long as a connection is successfully made using the cables the sound will remain faithful to the original signal because a digital signal can only be fully received or not received at all. Cables should meet the S/PDIF specification as defined by the international standard IEC 60958-3 for assured performance. The male plug has a center pin which is 3.175 mm (1/8 inch) in diameter, and is surrounded by an outer shell which is 8.25 mm (1/3 inch) in diameter. "Bullet plug" variation – Note the hollow center conductor and the pin point for the return signal. One problem with the RCA connector is that, when connecting the male into the female, the inner 'hot' (signal) connection is made before the 'cold' (ground) connection has been guaranteed; this often produces a loud buzz. Another problem with the RCA connectors is that each signal requires its own plug. Even the simple case of attaching a cassette deck may need four of them, two for stereo input and two for stereo output. In any common setup this quickly leads to a disarray of cables and confusion in how to connect them, which is made worse if one considers more complex signals like component video (a total of three for video and two for analog audio or one for digital coaxial audio). There have been attempts to introduce combined audio/video connectors for direct signals, but in the analog realm none of these has ever become common, with the exception of Europe where the SCART connector was very successful. 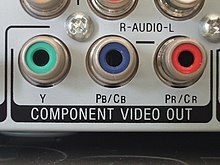 For a time the 5-pin DIN connector was popular for bi-directional stereo connection between A/V equipment, but it has been entirely displaced on modern consumer devices. Though RF modulators inherently transmit combined A/V signals in video applications, they depend on broadcast television systems and RF connectors which are not universal worldwide; RF signals are also generally inferior to direct signals due to protocol conversion and the RF limitations of the three major analog TV systems (NTSC, PAL and SECAM). Before HD television became a standard, nearly all TV sets, VCRs, and DVD players sold in Europe had SCART connectors, although these are sometimes supplemented by RCA and/or RF connectors. SCART-RCA adapters also exist, which usually allow input of composite video and stereo audio. Outside Europe, separate RCA connectors are usually used, supplemented by RF connectors for backward compatibility and simplicity. Although mini-DIN connectors are used for S-Video connections, composite video, component video, and analog audio (mono or stereo) all use RCA connectors unless the signals are sent via SCART. In the digital realm, however, combined A/V connectors are gaining ground; HDMI is commonly used today for consumer electronics, and DisplayPort, a potential competitor to HDMI, is often found on home computers and peripherals. The "hot" signal wire and signal ground provided by an RCA connection implement an unbalanced connection. A true balanced connection is generally preferred in certain applications, particularly professional settings, because it allows for the use of long cables while reducing susceptibility to external noise. Plugs and sockets on consumer equipment are conventionally color-coded to aid correct connections. The standard colors for the various signals are shown below; however, beyond 7.1 audio, the standard has degraded to a more general white/yellow, red/blue, and green/yellow color scheme for each cable respectively. Stereo audio applications use either black and red, grey and red or white and red RCA connectors; in all three cases, red denotes right. White or purple may also be replaced by black. Some older tape recorders, and equipment like receivers designed to connect to them, use a 5-pin DIN connector to connect left and right for record and playback with a single cable. Adapters between this connector and RCA connectors have used white and red for left and right channel recording, and blue (or sometimes black) and yellow for playback, but this is not universal. Most modern equipment with RCA connectors for recording devices simply uses white and red for all stereo pairs, whether record or playback. While these are the standard colors found on commercially made products, cables with different-colored connectors may be used, as long as the cable itself is compatible with the application (for example, cables with 75 ohms impedance for video and SPDIF). 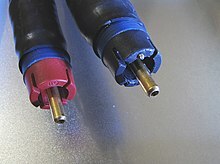 Wikimedia Commons has media related to RCA connectors. ^ "RCA 45 RPM 9-JY Record Player and RCA Tube Radio 6-XD-5". BlueBoy Records. Archived from the original on 2011-09-10. Retrieved 2011-08-23. ^ Pell, Rich (April 21, 2010). "The RCA phono plug: An outdated relic?". EETimes. Retrieved March 8, 2017. ^ Alan Henry (25 December 2013). "How To Connect Your Old Video Game Consoles To A New TV". Kotaku. Retrieved 27 November 2016. ^ "3 RCA plugs to Scart plug". Retrieved 2011-08-23. This page was last edited on 14 April 2019, at 16:51 (UTC).